The Monterey Court brings a whole new meaning to recycling. It is easy to see that the Monterey Court was once a roadside motor court of the 1930’s era. It is located on the south side of Miracle Mile road and east of the historic Ghost Lodge. Monterey Court may well have been one of the first motels along Casa Grand Highway which is now Miracle Mile. What once was a run down motel, was reborn in 2011 and easily is one answer to the question “what to do in Tucson?” The motor court office and a couple of casitas of the Monterey Court was converted into a bar, kitchen and cafe. An open air patio bar was added and provides a perfect place for friends to meet up and enjoy some appetizers and beverage of choice. Yes, there is still work to be done on the sign. The quaint guest casitas in the motor court have been converted to shops. The shops surround the shaded center courtyard and are used by Artisans to display and sell their creations. Now the fun part. The courtyard of the Monterey Court is now a outdoor dining and dancing area. The courtyard stage hosts performers from a wide genres. Seating is available for up to 300 guests. Misters are on during the summer and heaters are in position during the cooler winter evenings. The menu features a fresh seasonal food along with appetizers, sandwiches and salads. Prices are moderate. The wine list features domestic and French wines at reasonable price points. Wednesday features ½ off the bottle price. Visit the Monterey Court Website For More. In the mid 1930’s, Miracle Mile to Drachman was the first divided highway in Arizona and had roundabouts at both ends. Because of the wide medians, it was considered to be a very safe stretch of road. It was identified as the Miracle Mile of Safety by Arizona Highways. 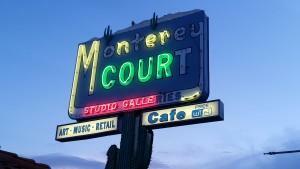 For those looking for a unique setting for an evening out, the Monterey Court Tucson AZ should be on your list. This place is a throw back to what “once was” in Tucson as well as across the United States during the 1930’s and 1940’s. If you are moving to Tucson AZ for work or considering it as a future place to retire or a winter retreat, we can help.